The first Ant-Man is one of my favorite Marvel movies. To me, it was a movie that showed what the MCU was capable of: Following a giant movie where a bunch of superheroes did their best to stop a killer robot destroy the world, we got a quasi-origin story that wasn’t afraid to show off the fact that it was part of this larger world, but tell a smaller story. Yes, pun intended. So, the real question was whether Ant-Man and the Wasp, the follow up, could live up to that promise, especially coming after Infinity War? The answer, I’m happy to report, is mostly yes. Ant-Man and the Wasp picks up some time after Captain America: Civil War, and slightly before Avengers: Infinity War, giving us a great reason as to why Ant-Man sit out the events of Thanos’s attack on the Earth. Scott Lang is under house arrest for trying to help out Captain America in his fight against… to be honest with you, I’m still not really sure what. To save Bucky? To stop the government from telling the Avengers where and when they couldn’t strike? One of those. In addition, Hank Pym’s technology has left Hope and Hank on the run as their technology is now illegal because when you get past that cool airport scene you have to admit that Captain America: Civil War didn’t make much sense. Scott may have the key to locating the original Wasp, Janet Van Dyne, who is currently stuck in the Quantum Realm, so they break him out so they can locate her and she’s lost for a hundred years. Along the way they’re pursued by two relatively unknown Iron Man villains. Oh, and Michael Pena’s Luis is back. That’s the part you’re really interested in. 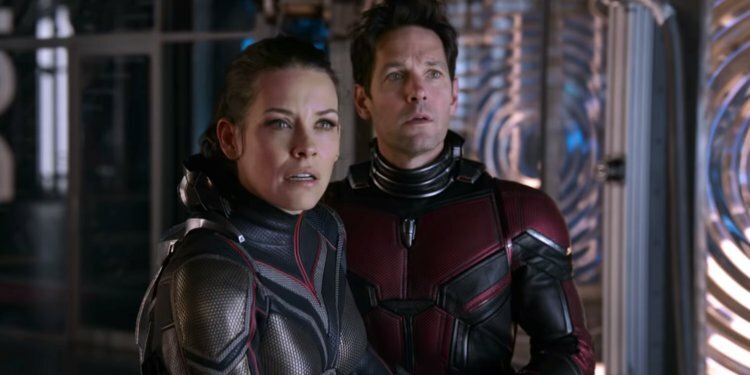 Once again, Ant-Man is positioned in an odd place: it’s a much more quiet, personal movie that has to deal with the fallout of Captain America: Civil War, while everyone watching is closely trying to pay attention to whether or not there’s going to be any mention of a purple alien who likes to accessorize who may or may not try to be balancing the Universe. But what everyone has managed to craft is a story about family that happens to involve a guy who wears a suit the can shrink down or expand based on what the story might need. The true standout, of course, is Evangeline Lilly as Hope Van Dyne, the Wasp. She was somewhat sidelined in the original Ant-Man as she was being protected from the horrible truth that her mom supposedly died saving the universe instead of dying in a plane crash, but here she is given a real chance to show what she can do. She is the Wasp, there’s no way around it. The thing is, I’ve always liked the Wasp because she wanted to be a hero: She wasn’t doing it out of a sense of duty or honor, she didn’t have a tragic background, she wasn’t a scientist trying to science her way out of everything, and she wasn’t some kind of super-soldier. She wanted to be the Wasp. No baggage. No angst. (Although there is some in this movie.) But honestly, she plays her with a sense of fun that should be in the character. I hope she’s signed up for a million more MCU movies, and they think about how she can improve every movie she’s in. I was also a big fan of Hannah John-Kamen, who played what is the closest to a villain in the movie, “Ghost.” She’s out of sync with ghost like powers thanks to the twin explanations of “science” and “creepy explosion” with a dash of “my parents died in that explosion.” She needs access to the Quantum Realm because it’s going to help prevent her from becoming destabilized. But she’s not really evil for the sense of power, she’s just trying to find a way out of a bad situation, and one that is a direct result of the rest of the movies. I could go on about the actors. Paul Rudd once again does wonderfully as a hero who cares more about his child than he does about anything else, and who is pulled into action. To be honest, he spends a good portion of the movie as the Wasp’s sidekick. Michael Douglas is great as the grumpiest of the old heroes, Hank Pym, and the two actors play off each other with some excellent comedic timing. What I want to focus on mostly is the fact that once again this movie is given that heavy lifting of being the “smaller” movie. Both Ant-Man and Ant-Man and the Wasp tell these stories across the backdrop of a larger Universe. The big elephant in the room going into the movie is “how does it fit into Infinity War”? The thing is, the MCU is going to need movies like this one if it’s going to survive. Not every movie is going have Universe destroying stakes and still be interesting. Not every hero can continue to face bigger and bigger odds until the stakes are pretty much gone. Yes, a small chase movie may not be what everyone is looking forward to, especially after the ending of Infinity War. But the best part is that it tells a great story, and one that doesn’t ignore the fact that there may be larger stakes. It’s not a 100% perfect movie. There’s a ton of exposition, and, like Scott says, they do tend to put “Quantum” in front of a lot. At times, they do tend to lean a little far away from where they exactly are in the timeline so they can play coy with the whole purple elephant attacking New York. But these are all minor. The movie is just fun. Which is what a superhero movie should be. I really hope we get a third movie in the Ant-Man saga.